Learn how Kidder & Jade met, fell in love, got married, and started a family. Great show! Very intersting to hear about your past lives and what you went thru before you got married. This is a great show! 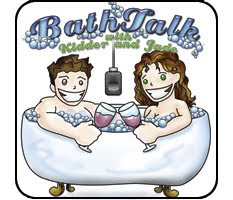 Jade and Kidder, you are both doing a great job with BathTalk. This is the first couples format show that actually keeps my attention. Thanks for being so candid and honest without all the fluff. I completely agree with the idea that no matter how much you love your first love, you really should know heartbreak and have experiences with others before you settle down.. I had a very similar experience with breaking up with my longtime high school sweetheart, while still loving him, to be able to have freedom in college. It still hurts to think of it (I never got back with him, though we're friends still).. but I'm so glad we parted ways then. I can't imagine my life without all the great people and experiences I know now. And I can't imagine waiting until later in college or after to start those experiences..